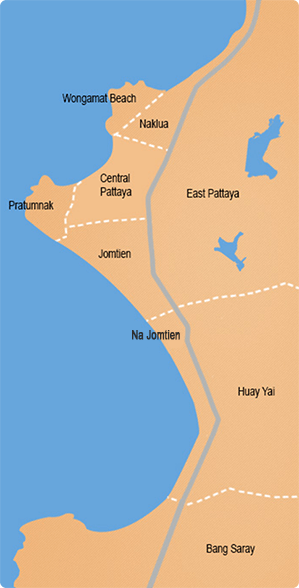 A new development in Jomtien. Welcome to this water wonderland. The biggest pool in the whole of Pattaya & Jomtien, it flows around the entire compound. There are child friendly areas, waterfall, Jacuzzi, bar and restaurant. Large gym on the top floor. There is excellent 24-hour security as well. Atlantis is located on Jomtien 2nd Road, 350 meters from the Jomtien beach, local shops restaurants and bars. There’s also easy access to Sukhumvit and all the other new attractions including Nong Nooch gardens, Cartoon Network water park and Silverlake Vineyard. The apartment is a corner unit, larger than the average one bed apartments. Everything is brand new, with 2 air conditioners, 40" Flat screen in living room, a balcony with swimming pool view, and of course it comes fully furnished. At the time the photos were taken, the condo was not completed. Great choice as own home or as investment. Corner units are rented out between 15,000 and 20,000 Baht, depend on season and on duration of the rental contract.